Hunting – it’s been part and parcel of what it means to be human since the dawn of our species. At one point, every human being on the planet survived by hunting and gathering their food. And, while today’s glut of grocery stores and super markets means that it’s no longer strictly necessary to hunt for our food, many of us still feel that primal urge. For some of us, it’s that time of the year to get outside, check our tree stands and do some hunting to put some meat in the freezer. Lets dive a little deeper into some of the best tree stands of 2017. Whether you hunt to supplement your food supply, or because you’re passionate about being self-sustaining, it’s an incredible experience. Of course, it helps to have the right tools and equipment. While primitive humans might have been forced to make due with stone-tipped spears and their fleetness of foot, you’re no primitive. You have access to modern hunting weapons, whether you choose to hunt with a gun or a bow. You also have the ability to choose your hunting area and use equipment that makes it simpler and easier to get a clean kill without spooking your prey. We’re talking about tree stands – one of the single most crucial tools available to modern hunters. Sure, you can use a hunting blind instead, but that puts you on the animal’s level, and can make it more difficult to get the perfect shot. Tree stands put you above the action, giving you a bird’s eye view of the situation and allowing you to spot your prey before it enters your field of fire. Of course, tree stands vary in terms of style, size, weight capacity and features, and it’s important that you’re able to make an informed decision here. A great deal of your hunting success rests on that choice. 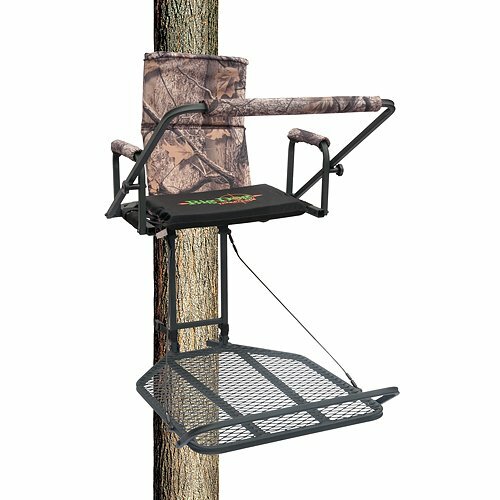 Durability: This one is crucial – your tree stand will be exposed to the elements, as well as supporting your weight quite a way up in the air. You want a tree stand that will hold up well to the rigors of hunting and hard use season after season. Weight: You’re most likely going to have to carry your stand in and back out again, unless you have a dedicated, private hunting area where you can leave it up all year long. That means you need to find the right balance between features and weight. Safety: Let’s be clear – you’re suspending yourself a long way above the ground. A fall might not kill you, but it sure won’t be a pleasant experience. 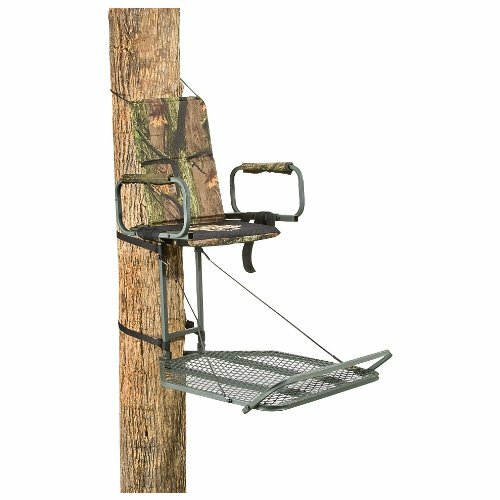 You want a tree stand that has modern safety features like a harness or belt that attaches to the tree. Cost: You’ll need to know your budget for a new tree stand, and shop around for the best mix of features and value. A “budget” tree stand might be in your price range, but does it offer the features you need? Likewise, an expensive model might have more bells and whistles, but can you live without them? Those are four of the most crucial considerations you’ll need to bear in mind while shopping for the best tree stands on the market today. We’ve assembled a list of the 10 best tree stands for hunting so you can compare, choose and buy quickly, and get out in the woods fast. While a particular tree stand might look amazing and have a ton of features, it may not be a great fit for your specific needs. Before you start shopping, know what features you must have, the ones that you’d like to have, and those that offer no actual value to you. We’ve assembled a list of the best tree stands for hunting that offers a range of features with prices as low as $60 and as high as $300. What that means is that each offers something slightly different, whether that’s an enclosed area, extra padding for comfort, a ladder for easy climbing or something else that you really don’t need like a cup holder. Most of the tree stands highlighted below need some assembly, and all will need to be securely attached to the tree in your hunting area. All of them include the most important hardware, but you may find that you need additional supplies – ropes, cables, ratchet straps, bolts and the like. So, bear that in mind as you peruse our reviews. All of the tree stands we’ve compiled come with secure harness systems to protect you in the event of an accident. However, remember that most of these are one size fits most systems, which means it may or may not be a good fit for you. Thankfully, there are aftermarket harnesses available for purchase if the one from the manufacturer is not a good fit. Of course, there’s also the fact that there are multiple stand types that will fit different hunting styles and preferences differently. For instance, while you might be fine with a climber model, another hunter might prefer the permanence of a two-man ladder model. Without further ado, here’s our first pick (and one that gets pretty high marks from customers). 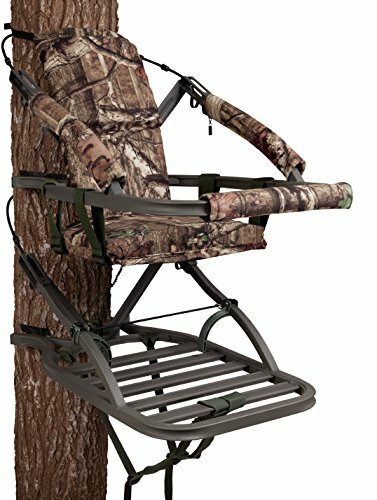 Overview: This particular tree stand gets high marks from customers, particularly those in search of a solid mix of comfort, convenience and safety. It’s also quite capable of holding you and your hunting gear securely. The full five-year warranty is also a nice plus. Everything you need to get up and hunting comes in the box, including the climbing stirrups, backpack straps, the quick-draw cable system and the body harness. It also features a closed front, aluminum construction, and weighs only 20 lbs. Notably, this tree stand features what the manufacturer calls, “dead metal”, which is a foam specifically designed to eliminate the metal on metal sound that some other stands suffer from, and which can startle your prey, sending it running before you’re ready. This might be the only review you need to read, if your budget isn’t too tight. This is one of the more expensive models in our review, coming in around the $300 mark. Overview: If you’re looking for a tree stand with a ladder, this model might just do the trick. The ladder measures a full 18 feet, getting you high enough above the action for a clear view. Both the platform and the ladder tether to the tree for greater stability and peace of mind, too. While this model does weigh more than some others (68 lbs. total), it does offer support for up to 300 pounds on the platform and is designed to withstand more permanent installation than some other models. It is also made from steel for greater durability and strength, as well as weather resistance. Of course, the flip up shooting rail is also a nice feature and can help provide the stability needed for an accurate shot. With that being said, this is designed as a one-person stand, so don’t plan on putting two people up in the air with it. Some customers have also noted that while everything needed for assembly comes in the box, the instructions can be a little vague at times. If you’re searching for a ladder-style stand that will be put up at least semi-permanently, though, this may make an excellent option for your needs. Overview: Made by the same manufacturer as the previous tree stand, this one combines solid steel construction with the compact form factor some hunters prefer. This hang-on model is designed to mount to a tree or pole with ratchet straps, and the seat is a suspension style design with plenty of room (17 x 10 inches). All seams in the metal are fully welded, and the surface has been powder coated to provide weather resistance. 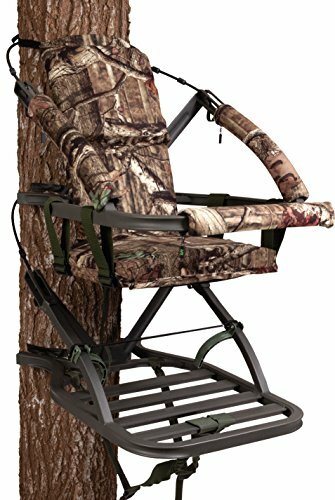 The seat does flip up, and the arms do as well, which makes this a potential option for bow hunters, as well as those who prefer hunting with a rifle. The platform itself is actually pretty large, and the flip up foot rest provides additional stability. There is no shooting bar with this model, though. Note that this is also not a climber model. While it does get overall good reviews from buyers, some have noted that the straps that secure the stand to the tree do weather, and should be replaced periodically to ensure safety. Others mention that it’s easiest to hang the stand on the tree, and then affix the securing straps. Finally, due to the weight, most buyers recommend hanging it with a helper, rather than attempting it alone. Overview: Do you make hunting a group activity? Whether you hunt with a friend or a family member, you know the difficulty in finding a two-man tree stand that’s worth your time and money. Enter the X-Stand Jayhawk ladder stand. Large and roomy, this stand offers seating for two, as well as several other perks. You’ll find a padded shooting rail in the front that spans the entire stand, as well as an oversized platform for stability and comfort. There’s a foot rail in the front, so stretching your legs on long days is no problem. You’ll also find that the seat are padded, as are the armrests, and the unique Comfort-FleX material of the seat back keeps you both comfortable and secure while up in the air. 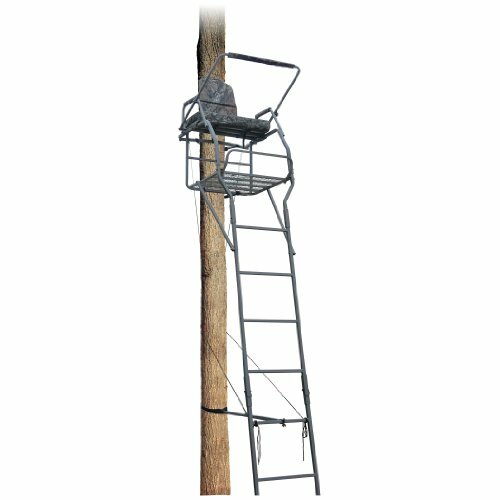 The ladder on this tree stand measures a full 20 feet, so you’re placed well above the scene, and the stand ships with two four-point body harnesses to keep you and your hunting partner safe at all times. The seats flip up for convenience, allowing use of the entire platform in a standing position. The footrest is also designed to flip out of the way if necessary. Note that this tree stand also includes a couple of extra niceties – two drink holders and accessory hooks. With all that being said, you’ll definitely need a partner or two to put the stand up, as it weighs in at 122 pounds. The frame is powder coated to withstand the elements, though, and most buyers cite the fact that this is one of the most comfortable stands they’ve used. Overview: If you’re shopping for a ladder style tree stand that’s large enough for two and capable of getting you a decent height off the ground, consider the Big Dog BDL-1050. The ladder puts you 17.5 feet up in the air, which is more than ample for most hunters’ needs. The ladder is also made using double tubing for additional stability and debility, which is a nice touch. One of the most interesting features of this particular model is the fact that both the seat and the platform are curved to fit the circumference of the tree you’re using. This provides not just an ergonomic solution, but a tree stand that offers visibility across a wider range. Most tree stands are square or rectangular, which means seeing prey to the right or left and the lining up a shot can be difficult. This tree stand helps get around that issue, and also includes a blind. The tree stand only weighs 102 pounds, which makes it one of the lighter two-man models on the market. However, you won’t sacrifice durability or stability for that lighter weight. The seats are padded, and the shooting bar is as well. However, some buyers do note that the shooting bar is too low for their preference, and it is not adjustable. Some also note that the seat padding is a little on the thin side, but that can easily be fixed with an additional cushion carried into the field. Overview: In search of a lightweight but stable tree stand that is easy to backpack into your hunting area? This might be just the ticket. The M25 is a hang-on style model, and it’s built to be super lightweight (less than 20 lbs.). It is easily attached to a backpack for carrying in and out, and the seat is designed to fold out of the way, providing full use of the platform for shooting if you prefer. This tree stand features solid steel construction and full welds. The seat itself is made from flexible mesh for comfort, as well as easy drying if it rains. It even ships with an ascender/descender in the form of a 35-foot rope with a carabiner and Prusik knot. Note that this tree stand has a 300 lb. capacity, and exceeds TMA standards. It secures to the tree with chains, rather than straps, which means greater durability in your mounting hardware. However, this stand does not include a backrest or armrests, so if you’re interested in more comfort, this might not be the model for you. It also lacks a shooting rail, although there is a foot rail attached to the front of the platform so you can stretch your legs. This stand can be used in the sitting position, but it is also designed to be used as a standing platform. While it might be minimalistic, this stand delivers where it counts. Overview: For those who want comfort and capability, this tree stand could be the best option. It combines some of the most in-demand features with a one-man platform that’s stable, durable and relatively easy to install in your hunting area. The seat, backrest and armrests are all padded, and so is the shooting rail. Note that the shooting rail flips up or down to meet your shooting needs. Note that the shooting rail can be removed completely if you hunt with a bow. The seat also folds up, allowing you full use of the platform in a standing position. The fall arrest system ensures that you’re secured to the tree in case of an accident, as well. Setting the stand up in the tree is also simple. However, some customers have noted that the assembly instructions are not particularly easy to follow (vague). Overview: There’s a lot to be said for climbing tree stands, particularly if you have to set up your stand on your own. This stand gives you the ability to climb to your desired height and then lock the stand in place all on your own, thanks to the “RapidClimb” stirrups. This stand also features a quick draw cabling system that allows you to secure the stand in just seconds without the need to tighten bolts, insert pins or ratchet straps. One of the most interesting features of this tree stand is the sound deadening foam built into the frame. It’s designed to help minimize noise created by the stand if you shift position. Of course, the fact that this stand only weighs 18 pounds is also an advantage, meaning that you can easily carry it in and out, even on a daily basis if you need to. Note that the frame is made from aluminum, with fully welded seams and joints. The stand also comes with a five-year warranty, as well as backpack straps for easier carrying. The front of the Mini Viper SD is enclosed by an aluminum shooting rail (padded) for additional security when standing, as well as stability for shooting. Finally, the 300 lb. weight limit means that it’s a great solution for even larger hunters. This tree stand definitely is one of my favorite climbing stands due to it’s stability and strength. Overview: The shooting rail is padded for comfort, but it also folds out of the way if you prefer. The seat features a one-inch cushion, which may or may not be enough padding depending on your preferences. The platform measures a full 37 inches by 13 inches, so there’s plenty of room for both you and your partner, and the seat measures 38 inches by 13 inches. Note that this tree stand requires a tree with a minimum of nine inches in circumference – it cannot be securely attached to smaller trees. Note that while this stand is lighter than some other two-person models on the market, you will need a helper when it comes to setting it up in the tree. Some customers have also reported that it takes a while to assemble completely. A few customers noted that it was a tight fit with two people, but there was more than ample room for a single hunter with gear. Overview: Climber models give you the ability to get up in the tree and set up without the need for an extra set of hands. Just use the climbing gear to reach your position, and lock in the tree stand. In just minutes, you’re ready to go. 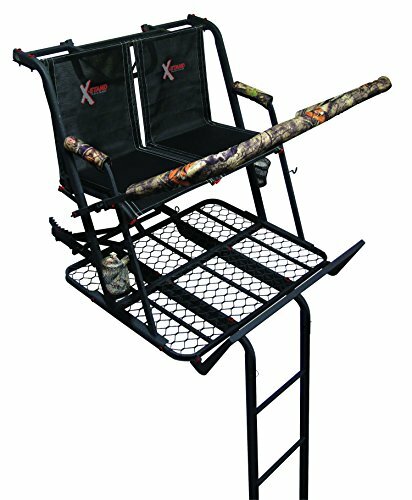 The Guide Gear Extreme Deluxe Hunting Climber Tree Stand offers several features that you’ll find beneficial, including full steel construction. Saying that, the steel in the frame does make it heavier than aluminum models (33 pounds), so it might not be the best choice if you have to pack your stand in and out frequently. The seat, backrest and armrests are all padded with one-inch foam. While that might be more than ample for the armrests and backrest, some customers find it too thin for the seat. Note that the material of the seat is not designed for long-term exposure to the elements, so leaving it in place for extended periods of time isn’t really recommended. This tree stand does come standard with a safety harness. However, some customers have noted that it is pretty basic and have opted to purchase upgraded harnesses from other vendors. It’s also worth noting that many customers reported that the assembly instructions were either difficult to follow or vague, but that assembly isn’t particularly problematic even without the instructions. Will I be hunting alone or with a partner? This will affect whether you need a stand for a single person or a two-person stand. Depending on the relationship with your partner, you may also need two single-person stands (if you’re hunting with your child and are responsible for buying both, for instance). Will I have help to put the stand in the tree? This will be affected by the weight of the stand, as well as the style. For instance, climber models can be installed on your own, but a heavy, hang-on model will probably require another set of hands. Some of the heavier two-man models will need at least three people to get them up securely. Will I be hunting with a bow or rifle? If you’ll be bow hunting, look for a model that offers folding armrests (if so equipped), as well as a folding shooting rail. If you’ll be hunting with a rifle, make sure that the shooting rail is stable, and that it is high enough for your preferences. Do you have a way to get the stand to your hunting area? Heavier stands, even one-man stands, can be difficult to carry long distances. If you’re considering a heavy stand, think about transport and how you’ll get your stand to its destination. Is the weight capacity enough for me? While most of the stands we’ve mentioned have at least a 300-pound capacity, that may not be sufficient. Not only will the stand have to hold you, but it will also have to hold at least some of your gear. Know how much the gear you plan to take weighs and then buy appropriately. Do I want a ladder stand, a hang-on or a climber? This is one of the more difficult questions to answer, as each style has something different going for it. Ladder stands are the simplest to get into. Hang-on stands are among the lightest on the market. Climber stands can easily be set up with just one person, and are usually lightweight. A lot will also depend on the area in which you’ll be hunting, the available room, the type of trees in the area and other factors. Will I be leaving the stand in place for an extended period of time? This question will have an impact on several things. Obviously, you need to make sure that the frame is designed to withstand weathering and resist rust. However, you also need to consider the fabric and padding of the seat, armrests, backrest and shooting rail. Will it stand the test of time? How much comfort do I really need? 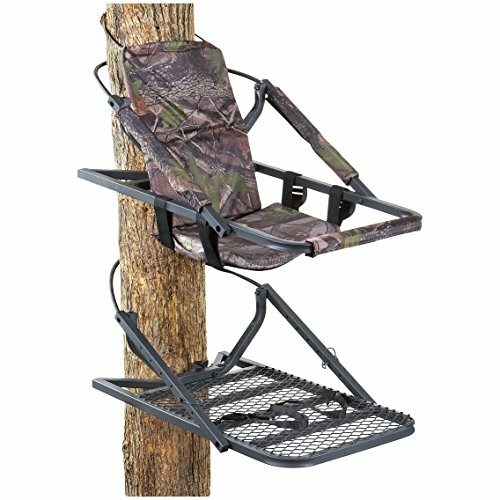 You can save some weight (and cost) by sacrificing padding and going with a mesh-style seat for your tree stand. However, remember that you may spend long periods in your stand before making a successful shot, so you’ll want to balance savings with comfort. With that being said, some of the mesh-style chairs (sling style, in particular) are comparable to padded chairs in terms of comfort. In addition to those questions, you need to consider your budget. How much do you have to spend on a tree stand? This will often take precedence over features that would be nice to have, but aren’t critical. With that being said, you don’t necessarily need to shop for “bargain” tree stands, as a little more invested at the outset can often land you a stand that will last longer than one made with cheaper materials. This is particularly true if you’ll be using the stand frequently, or plan to leave it up for an extended period of time. Durability is a crucial factor, and that often means paying a little bit more. You’ll recoup that money (sometimes several times over) by not having to replace the stand as frequently. Whether you’re on a tight budget, want to hunt with a partner, need a solution that will work for solo hunting, or prefer a specific style to another, you’ll find something on the list above that will work for your needs. If you do not find an appealing stand listed, it may be that you need to reconsider what’s a “must have” and what you can live without when it comes to features. You might also want to consider what you can do on your own to make a particular stand more user-friendly or applicable to your situation. Finally, if you have questions or comments about any of the tree stands we’ve listed, we’d love to hear from you. Just post them in the comments below. If you’ve used any of the stands we highlighted, we would be interested in hearing what you thought of the performance, build quality, features and overall impression of the stand that might help other readers find the best tree stands for hunting. I have the Jayhawk stand for two of us. It works nice. A bit more pricey, it was still worth it. Recommend that one if it’s in your $300 budget range. You definitely do not want anything over 20 ft. high if you are afraid of heights. You probably should go with something in the 15 to 18 foot range. 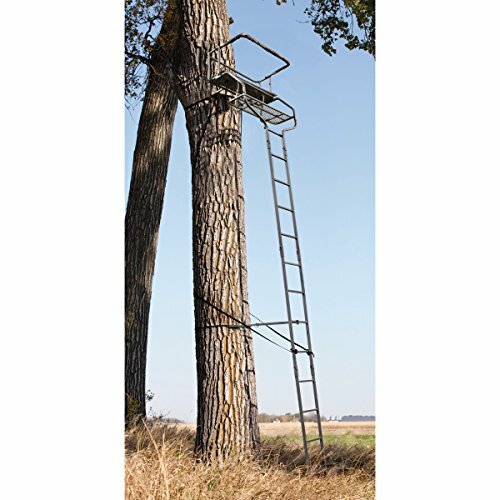 The Guide Gear Jumbo Ladder Stand measures only 18 ft. and is a good recommendation. You definitely want to get a ladder stand, it makes getting into the tree so much easier. Hope this information helps and good luck hunting! I’ve always been afraid of climbing stands. I bought the Jayhawk thanks to your recommendation. It’s a very heavy duty stand and took two of us to raise it up there. It also took some time to put together. But I would rather take my time in putting up a tree stand knowing I was going to be up in it. The price was a bit higher than others, but I like to pay for quality and durability and I believe this is what I’m getting with the Jayhawk. Do they make any deer stands for people that weigh over 300 pounds? Pettus, the majority of tree stands are rated for 300lbs. Some are even rated up to 500lbs. Scroll back up the page and take a look at each one for a specific weight limits. Which would be the best tree stand for coyote hunting? Thanks Willis for the question on tree stands. There are many tree stands that serve multi purposes for deer, coyote and turkey hunting. You can either use a hunting blind or tree stand. I would just get something you feel comfortable with. If you don’t want to be in the tree with a rifle or shotgun, then I suggest getting a ground blind. Otherwise, get a ladder stand such as the Jayhawk to give you a large view to scout for coyote. 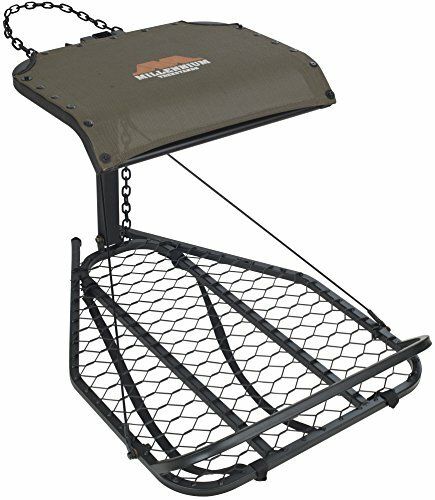 For a good climber up to 350 lbs check out treewalker tree stands. Im 340 lbs and i have stayed in mine all day and even changed u in the stad. Love mine.